The same theme is found in the Epistle of Barnabas, another early non-canonical text. These early Christian writings affirm a close link between moral behavior and one’s eternal destiny but show little interest in the details of the eternal punishment about which they warn. Other texts, such as the Apocalypse of Peter, go farther, providing lurid descriptions of the punishments that correspond to particular sins. Adulterers, for instance, would be punished in this way: “And there were also others, women, hanged by their hair above that mire which boiled up; and these were they that adorned themselves for adultery. And the men that were joined with them in the defilement of adultery were hanging by their feet, and had their heads hidden in the mire, and said: ‘We believed not that we should come unto this place.’” This theme would show up frequently in medieval visions of hell (including Dante’s) and also finds striking echoes in the Qur’an. While Justin was reticent about the implications of this idea for the eternal fate of pagans, his ideas about the Logos inspired later Christian speculation about “virtuous pagans” who might somehow have access to the truth of Christ apart from the usual channels—making Justin the father of the inclusivist tradition within Christianity. Clement of Alexandria was arguably the first Christian writer to speak of the apokatastasis, the return of all created beings to God. He also suggested that the fire of judgment is a fire of purification rather than destruction. However, he did not develop his ideas systematically. Irenaeus, bishop of Lyons, is best known for his refutation of the Gnostics. The Gnostics used the prooftext “flesh and blood will not enter the kingdom of God” (1 Cor. 15:50) to argue against a bodily resurrection. Irenaeus argued, in contrast, that Jesus took on human nature in order to redeem every aspect of humanity, including our physical bodies. Irenaeus described the fall as the deception of an innocent, childlike Adam and Eve by Satan. While Irenaeus believed in eternal punishment, he stressed Jesus’ redemption of humanity as a whole, with damnation as the fate only of those who chose to reject this redemption. Tertullian, the fiery Christian apologist from North Africa, eloquently represented the most rigorous aspects of early Christian thought. He believed that serious post-baptismal sin could not be forgiven and argued against infant baptism on that basis. In his writing against paganism, he noted that the eternal flame tended by the vestal virgins (aristocratic priestesses in traditional Roman religion) was an apt symbol of the fate that awaited them after death. Origen was perhaps the most controversial early Christian writer on eschatology (and other doctrines as well). Deeply shaped by the traditions of Middle Platonist philosophy current in second-century Alexandria, and by the work of Clement, Origen understood the drama of salvation history as the divine initiative to restore created “minds” to the ecstatic intellectual union with God in which they were originally made. The entire physical world, in Origen’s theology, was a purgatorial discipline created by God in order to give fallen minds the necessary stimulus to return from their state of apathy. 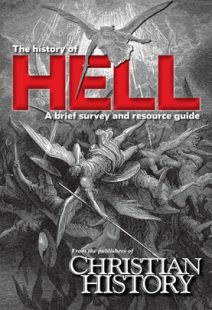 Hell was simply an extreme form of that purgatorial discipline, and the Scriptural texts speaking of eternal punishment were benevolent deceptions by God meant to shock us into repentance. While Satan and the demons are at a disadvantage because they lack bodies, Origen expressed hope that they too would return to God in the apokatastasis, the final restoration of all creation. The apokatastasis was condemned as heretical at the Second Council of Constantinople in 553, three centuries after Origen’s death. Athanasius, patriarch of Alexandria and staunch defender of the full divinity of Jesus, described salvation primarily in terms of restoration to union with the divine life. Since we are created from nothing, Athanasius believed, we tend to fall back into nothingness when separated from the divine life through sin. This is both the natural result of sin and a just punishment imposed by God. All aspects of human weakness and “corruption” are thus the result of our separation from the divine life. Like Irenaeus, Athanasius believed that Jesus had redeemed humanity as a whole by taking on the just punishment of our sins in his death (thus defeating death and ending its legal claim on us) and by restoring the link between human nature and the life of God. Athanasius’s understanding of “corruption” seems to imply that the wicked would eventually be annihilated, but he does not seem to have drawn this conclusion. He may instead have believed that damnation was an endless slide toward nothingness that never quite got there—a view later suggested by C. S. Lewis. Gregory Nazianzen, one of the “Cappadocian” theologians who helped formulate the doctrine of the Trinity, discussed Origen’s concept of the apokatastasis and refused to take a decisive stance for or against it, preferring to leave the question to God. Gregory of Nyssa, another Cappadocian, drew heavily on the work of Origen, including his doctrine of the apokatastasis. Gregory was fond of the image of the refining fire, which burns out the dross from the ore. While he sometimes spoke of eternal punishment, he seems to have understood this merely as a long-lasting purgatorial punishment that would eventually result in salvation. The corruption of human bodies, Gregory argues, is purged by physical death, while the corruption of the soul is purged by punishments after death. Gregory was one of the greatest exponents of the “ransom theory,” whereby Jesus offers himself to Satan as a ransom for the souls of sinful humanity. When Satan clamps down on the “bait,” he is caught by the fishhook of Christ’s divinity and humanity is delivered. Gregory goes on to say, however, that this defeat of Satan is not only for our good but for his, since Satan too will ultimately be restored to union with God. Jerome was influenced by Origen in his earlier writings and allegedly defended the view that all the baptized would eventually be saved, with only the demons and non-Christians being eternally damned. This view was rejected by Augustine, and Jerome himself turned harshly against Origen’s ideas in his later years. Augustine, unquestionably the most influential theologian of the Western church, defended the doctrine of eternal punishment against the followers of Origen and others who held to a more “purgatorial” understanding of hell. (Augustine also believed in some form of purgation, but he saw this as something fundamentally different from hell.) More significant, perhaps, was his doctrine of original sin and the resulting view that fallen human beings constitute a massa damnata, condemned as a whole for the sin of Adam and Eve which has been transmitted to them as a corruption of the will. God graciously chooses some human beings from this condemned “mass,” who then share in the salvation procured by Christ when he ransomed humanity from the devil. Maximus is best known for his de- fense of the doctrine that Jesus has a human will distinct from his divine will, and that the humanity of Jesus has saving importance for the redemption of human beings. Maximus’s theology was deeply shaped by that of the Cappadocian Fathers including Gregory of Nyssa, and thus by Origen. Maximus used the language of apokatastasis, but he also warned that human beings can reject God’s grace and experience “ill-being” rather than “well-being.” He appears to have believed that all creation will be restored to the primal knowledge of God, but for those who have chosen to reject God this knowledge will be a source of sorrow rather than joy. However, the cosmic implications of his Christology are such that, in the end, all will return to God. The process of return will involve purification, and “ill-being” and sorrow will eventually arrive at “well-being” and joy.